12 Gauge Buckshot is a type shotgun ammunition that fires a wide spread of 14 low-damage pellets. Regardless of the weapon it is fired out of, it is extremely lethal in close quarters, capable of one-shotting fully geared players at point-blank. 12 Gauge buckshot has fewer pellets than the Handmade Shell, but makes up for it by doing much more damage with each pellet. 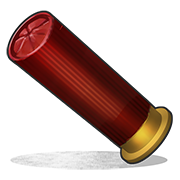 Ammo for shotguns which are a step above the Homemade Shell, the damage is higher though it is more expensive and requires a level 2 workbench. Considering the slightly higher cost but unmatched stopping power at close range this is extremely helpful to have when you are using any type of shotgun. Remember to aim for center mass of targets for the highest amount of pellets hitting.